How to choose the right school? © Copyright 2001 - 2017 ITTO. If your native language is English and you are a university graduate or have teaching experience, you will be automatically accepted on application. In this case, please forward a required $200 USD reservation fee or full course payment along with your application. The International Teacher Training Organization will meet all credit card transaction costs. The reservation fee is deducted from the overall course fee and is in place to secure a place on your chosen course. 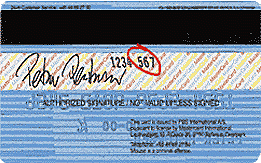 The CVC2 code consists of the last 3 digits of the number printed inside the signature field on the back of your credit card. © Copyright 2001 - 2019 ITTO.